She fights for the cause,. He fights for her. The first new champion release of 2017 in league of legends is looking to be a big one. Being teased initially not long after April Fools Events such as Advanced Bots and Graves Cigar, it was a bit unclear what exactly was going on. 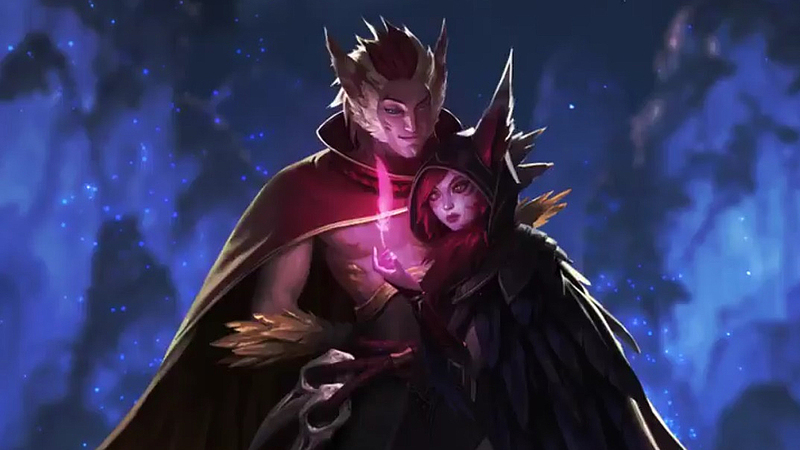 The two prevailing theories at first were a Quinn skin/rework, which wasn’t as popular but worth mentioning, or something to do with Kayle owing to looking like the champion teased was in the middle of her ultimate. Earlier today though Riots Twitter, followed by their Facebook and Instagram shortly thereafter released the full teaser revealing it not to be one but two very close champions. The Community is stirring for more details on this champion, since not much is yet known but as with all champion teases the League of Legends fanbase knows its soon to come out. Clearly there are two entities to the release, so some people postulate that this may be LoL’s attempt at a dual champion similar to Cho’Gall from Heroes of the Storm. While a novel theory there are some problems with it, the biggest of which is with LoL’s ban system, currently 6 total at 3 per a side, depending on this champions position in the Meta and prevalence it could effectively be a two for one ban which isn’t exactly fair. Worth noting however, and why the Quinn theory earlier was worth mentioning is Quinn’s original Kit on release included the Ultimate Tag-Team, which on a short cool down replaced Quinn With her Hawk Valor who shifted her from a ranged focus to more of a Melee Fighter for a short period of time. Though this is no longer the case it was stated at the time of her rework which changed her Ultimate to the current ‘Behind Enemy Lines’ Rioters did mention they liked the idea and may shelf it for a revisit it for a future champion. Similar to Kindred’s status as a Dual-Champion Riot may be exploring the Concept with some of the new mechanics they’ve introduced since her released, with some classic mechanics like that of form swapping as seen in Champions Like Nidalee, Jayce, or Elise. Kled also Comes to mind, having a separate Health bar for his Companion Skarl, which gives him two unique play styles that make for an interesting champion, they may try that again with more of a voluntary Swap in mind. There’s no way of knowing for now though, so if you want to find out as details are revealed and confirmed you can find out all about them here at MMOSpotlight.com!